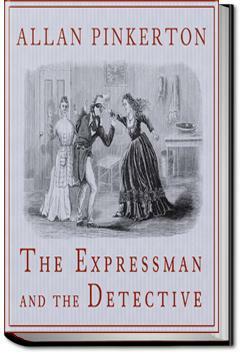 The Expressman and the Detective is Pinkerton's first attempt at putting his real-life experiences into novel form. Though many later works attributed to Pinkerton are understood to have been ghostwritten, this is the work of the man the London Times calls "a man at once deeply admirable and quite obnoxious." . . .Chicago I selected Mr. Green to "shadow" Mrs. Maroney. Giving him the same full instructions I had given the other operatives, I despatched him for Montgomery. He arrived there none too soon. Mrs. Maroney had grown rather commanding in her manners, and was very arrogant with the servants in the house. She also found great fault with the proprietor, Mr. Floyd, for not having some necessary repairs in her room attended to. One of the lady boarders, the wife of a senator, treated her with marked coolness; and these various circumstances so worked on her high-strung temperament that she was thrown into an uncontrollable fit of passion, during which she broke the windows in her room. The landlord insisted on her paying for them, but she indignantly refused to do so. On his pressing the matter, she determined to leave the house and make a trip to the North. Allan Pinkerton tells how his relatively small P.I. firm succeeded in this first big case. Interesting, but really puts the procedure in procedural, which made this feel as not as quick a read as I was hoping (it says it's equivalent to 165 pages). Great detective story written by Allan Pinkerton himself. I enjoyed every page! Very much enjoyed it. Pinkerton is very much like that guy on TV's Mantracker, which is something to very much admire, especially in the 1800's. This 1859 story takes place for the most part in Alabama and in the Northeast. The Pinkerton Agency is employed to discover who stole the sum of $50,000 from Adams Express. Their chief suspect is Maroney, a trusted employee. Allen Pinkerton set this story in Atlanta with travels to Jenkintown, PA. I am more familiar with Jenkintown and Philadelphia in the 1880's. I love the term shadowing (following a suspect). He also has detectives going undercover.